The client is available for Windows, MAC and Linux..
Once installed and opened, you will be presented with a program which for some users might seem confusing, but you only need 3 items to connect to your FTP. These are all included in the welcome email that you got from us during the signup. Once the program is opened you will be presented with the following options at the top of the client. The informations need to be inserted into the fields in the same order as they were listed above, once you have inserted them hit the quickconnect and it will load. 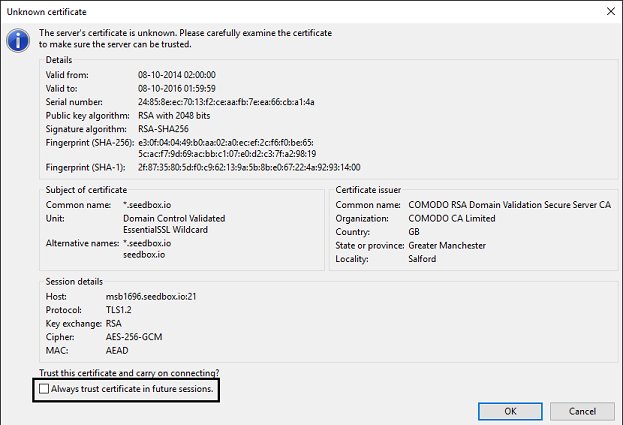 Make sure you tick the option: "Always trust certificate in future sessions." If you are already actively downloading, right click and hit "Add to Queue"
The bottom part of FileZilla will show you ongoing transfers, including the total queued size.